Home/Tree Plantings/Tree Plantings in Victoria/Running a small footprint event with Linux. Another successful ‘open source software‘ conference was held earlier this year by Linux.org.au. To help reduce the carbon footprint of the event, conference organizer Sae-Ra Germaine gave attendees the option to ‘tick’ a box (upon registering) to buy a tree for one of our community projects. 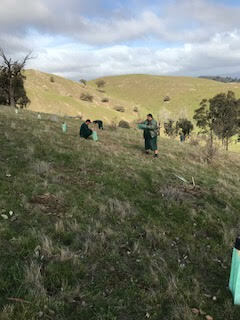 Thanks to the generous attendees, enough money was raised to enable us to plant 215 trees at one of our favourite sites … Alexandra, Victoria. We planted your trees on a farm at Alexandra with a team of workers from the Dhurringile Prison Landmate Team. The fellas did a great job. Trees have been well planted and will be properly maintained and watered over the summer. Themed Linux of Things, the 2019 linux.conf.au will attract speakers and attendees from across the world to socialise, fraternise, lecture, listen, ask, answer and share with their peers. The conference will explore the use of free open source software and hardware for internet of things devices, along with security concerns, privacy and legal aspects, environmental impacts, everyday communication, health and ethics. Behind this is an ever-increasing demand for always connected sensors and devices, exchanging, collating and analysing data, and often making decisions without us even noticing. Linux, with its lightweight footprint (yeah!!) and robust security and importantly its open source nature, has become a core component in this: Linux of Things. Thank you to all at Linux for continuing to promote a small footprint event and at the same time help us with our community tree planting projects.